Mineral oil free, Substance Nappy Rash Ointment forms a protective barrier against wetness as it soothes and protects baby's skin. Our herbal formulation of calendula, marsh-mallow, St. John's wort, yarrow and myrrh powder has been designed specifically to balance young, sensitive skin. The herbal qualities are set in a rich nourishing base of shea butter, carrot oil and cocoa butter. Sweet scented roman chamomile essential oil completes this indispensable multi-purpose ointment. 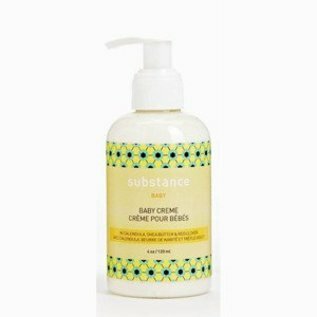 use for: diaper rash, cradle cap, winter dryness, chapping, cuts & scrapes and sunburn.